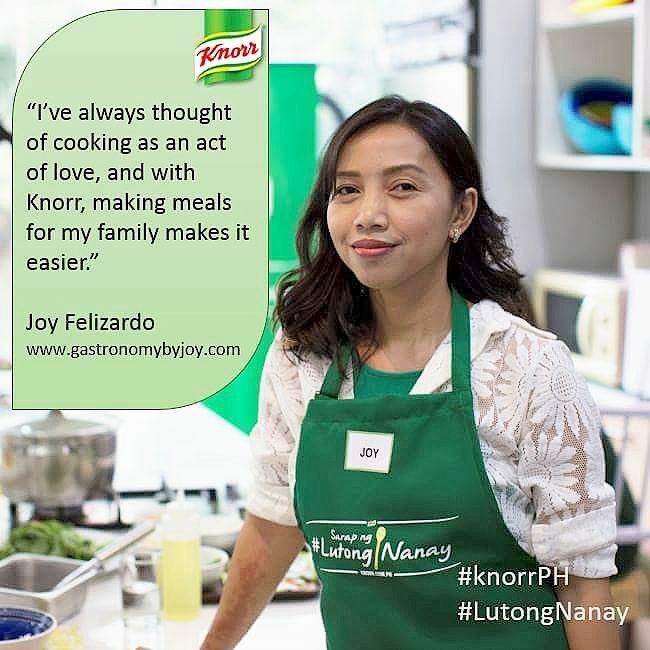 GASTRONOMY by Joy: Why Your Kids Need to Try Blue Post Boiling Crabs and Shrimps? Why Your Kids Need to Try Blue Post Boiling Crabs and Shrimps? 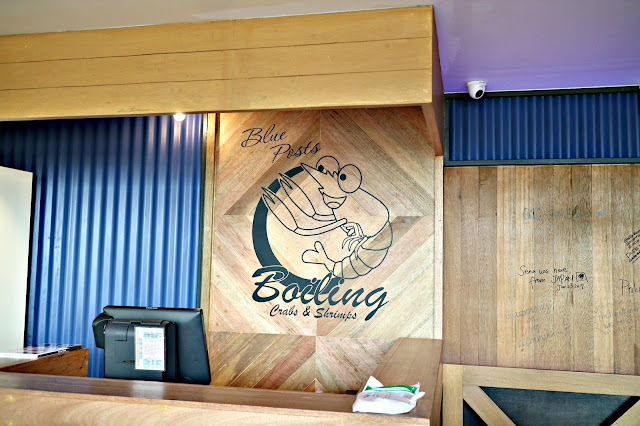 I've been loving my regular visits to SM Mall of Asia lately as many new restos have opened up and one of them is Blue Post Boiling Crabs and Shrimps. 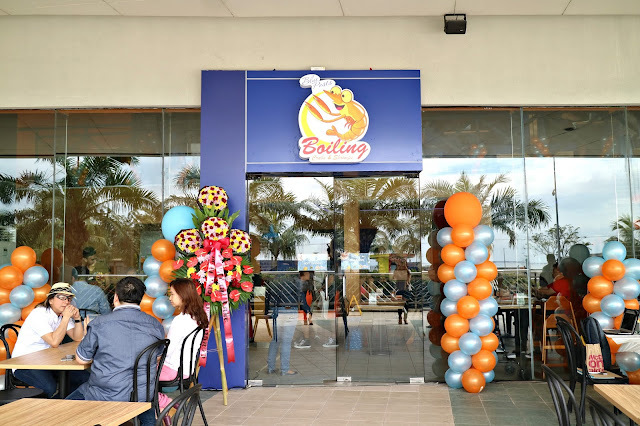 This is actually the second branch in Manila and it originated from Davao. I love Davao and just a year ago my family and I found ourselves wound up in it's beauty. We did try a couple of restaurants but we were more in the country side so we missed a lot on that area. 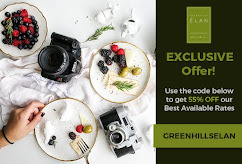 Believe me, you, Davao is a haven for foodies and one of it's pride is Blue Post. But sadly, we weren't able to try it there. Fast-forward to this year, I'm seated together with foodie friends enjoying what Blue Post seems to boast about, seafood boiled in bags bathed in glorious different sauces. 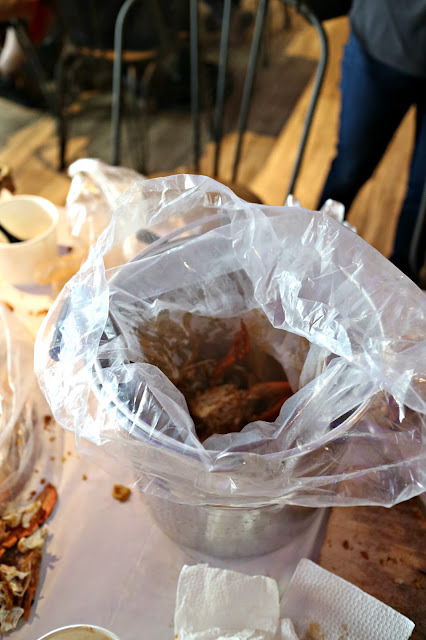 As I arrived, a bit late, my friends were already prepared to attack the table as a bag of shrimp, cups of soups, and an awesome sight of fried crabs in salted eggs were laid out. 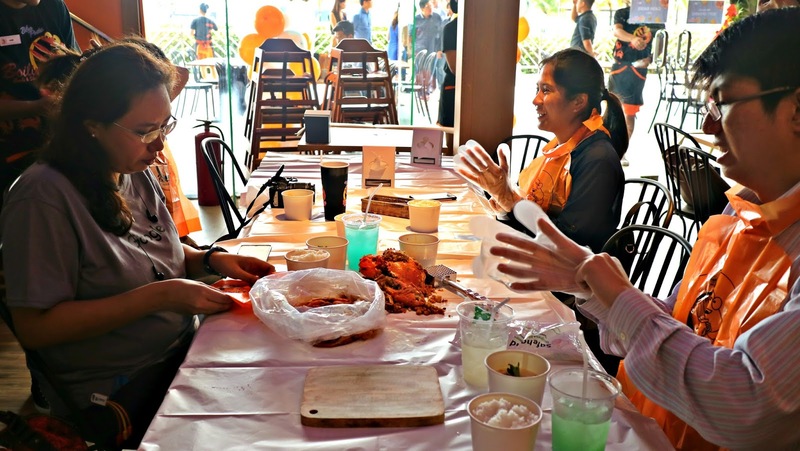 Most of them were already donned in Blue Post's signature orange bib, cause eating messy is just the thing here. So why would I bring my kids here, if using utensils aren't suggested? 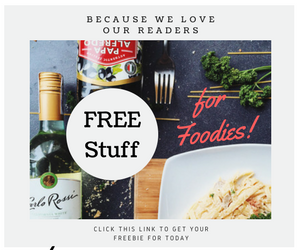 To add to that, why would I want them to eat on the table instead of clean sanitized plates? Lastly, why would I risk having their clothes getting stained or dirtied? 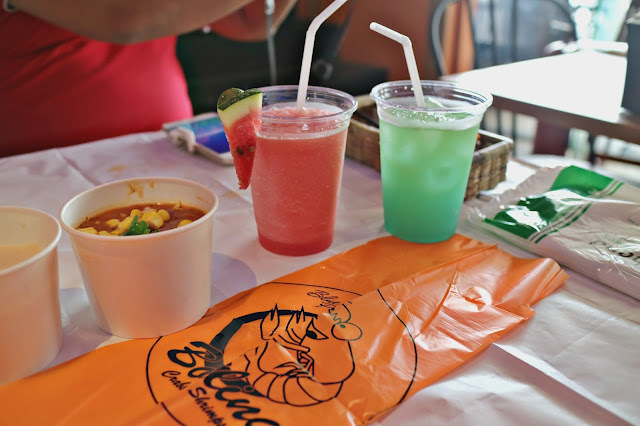 All because Boiling Crabs and Shrimps makes eating seafood fun and exciting! Blue Post Boiling Crab and Shrimps is the next best thing to dining in Davao and Manilenos can rejoice for there's no need for you to get on the plane to savor Davao's treasure. So kids and kids at heart let's dig in! 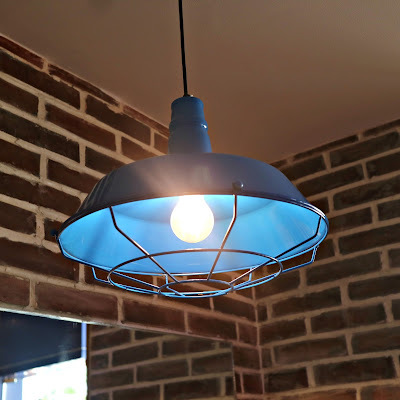 They make sure the quality of crabs they serve is fresh and is locally sourced out. So whenever you order you always get the standard size and weight. Step 2. How do you want your seafood cooked? Sambal - Your seafood cooked in sambal paste. A fusion of Indonesian/Malay dish with a twist. The spicy version. Salted Egg - Your crabs and shrimps get the royalty touch as they get coated with a batter generously mixed with salted eggs, real salted eggs which get to be fried with them. This is babies were cooked in Lemon and Garlic Sauce which I prefer together with Fried salted egg option. 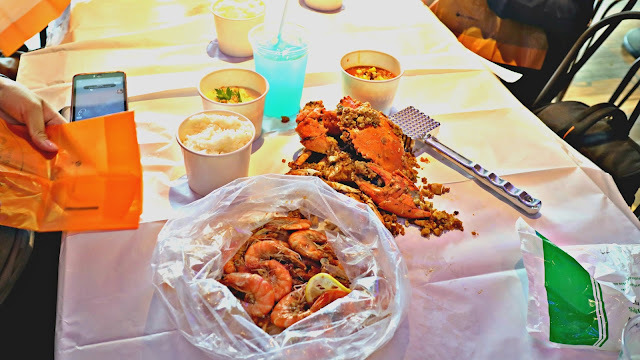 Crabs and shrimps in Salted Egg is my favorite, as bits and pieces of salted eggs are present and give out the saltiness and added both crunch and rich fatty texture to the batch. Look how big their crab is! 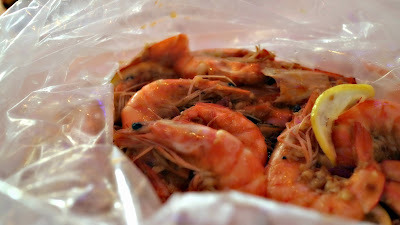 Apart from Blue Post famous boiled and fried seafood bags, you might want to try their Sinuglaw. 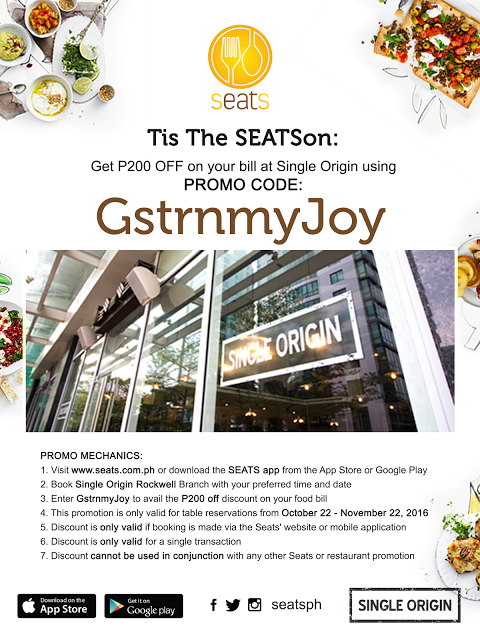 It's a portmanteau of "sinugba" and "kinilaw." Sinugba in Visayan dialect meant grilled, in this dish grilled pork cubes were added to the fish ceviche or better known in the country as kinilaw or kilawin. I love that it has that right balance of sourness and spice from the ginger and the chilies. Better quench your thirst with the slush perfect for the summery heat given of by the bay, have the Watermelon Calamansi for a try and you'll thank me for it. Or if you want to play some more, why not have it in the mixology station. Here, Nestle fruity and iced tea concoctions are available for you to mx n' match with. Another thing your kids will love coming here.